This entry was posted on February 1, 2017 by Zoe Thomas. For every minute a victim of cardiac arrest doesn't receive defibrillation, their chances of survival drop by 10%. Every year in the UK there are around 60,000 cases of cardiac arrest. The chance of surviving this event (when the heart stops pumping blood around the body) is just one in 10. However, if certain things are done in the certain order, those chances can be dramatically increased. Early access - Identifying cardiac arrest and summoning necessary assistance. Early CPR - Administering chest compressions to keep the heart pumping before the defibrillator arrives. Early defibrillation - Defibrillation shocks the heart back to a normal rhythm. Early advanced care - It takes on average eight minutes for paramedics to arrive in an ambulance, so if you start CPR within two minutes, start defibrillation in four minutes, then the patient may have a 40% chance of survival. Our first aid training courses will teach you and your employees how to recognise signs of cardiac arrest and how to administer CPR. Cardiac arrest can happen at any time to anyone - anywhere. Considering that one third of our lives are spent at work, there is a fairly high chance of someone suffering a cardiac arrest in the workplace. The key is to be prepared with trained staff and an on-site AED like the HeartSine. We have recently added three new HeartSine models to our online shop - the 350P, 360P and 500P. All three feature illustrated instructions and voice prompts to guide users through the whole defibrillation process. While training is recommended, they are designed to be used by anyone and can be used on both adults and children. The HeartSine is an automated external defibrillator (AED) that analyses the heart rhythm to identify the right time to deliver an electrical shock to restore the heart to normal rhythm. Everything you need comes in a portable, light carry case (it is one of the smallest, lightest defibrillators on the market). It also carries the highest industry rating of durability so it can be used even outdoors in poor weather. 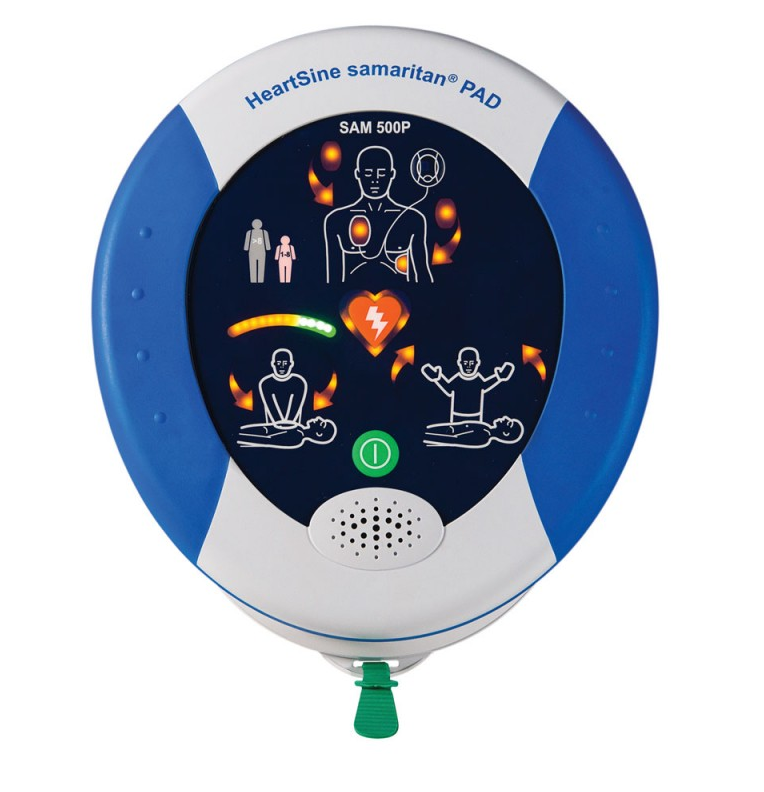 We also sell complete replica training modules in all three models so employees can familiarise themselves with how to use the HeartSine AEDs.